Penguins are cool with the cold. They waddle around the Antarctic, they play in the snow, and they splash around in the water without a care in the world! Of course, penguins are prepared for the cold weather and if your child wants to waddle around in the winter like a penguin, then you'll definitely what to prepare them like a penguin. 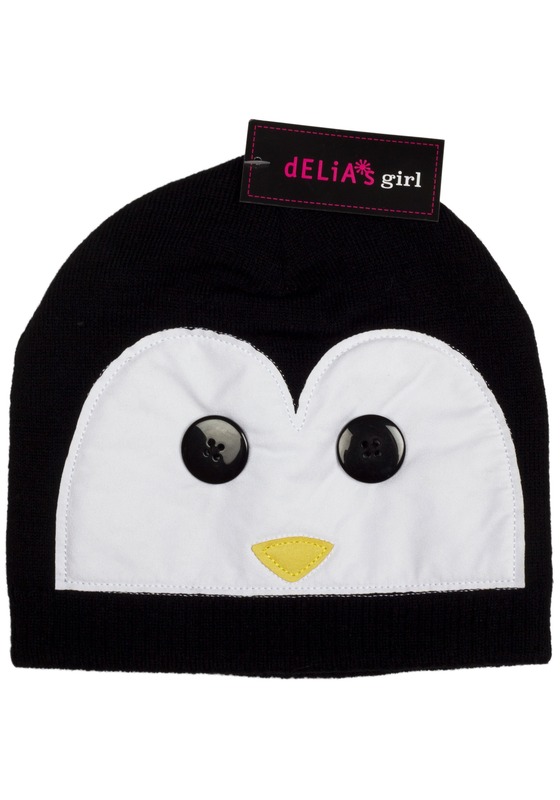 That's where this Delia's Penguin cold weather beanie hat comes into play! This hat will help your child look like an adorable penguin while they stay warm and cozy. This hat is made from acrylic knit fabric and stretches for a snug fit on your child's head. The front of the beanie has cute penguin face sewn onto the front and it's even topped off with a pair of button eyes. Just add it to your child's winter gear to make sure they stay as comfortable as a penguin! If you want your child to be as cozy as a penguin, then this adorable hat is the perfect way to top off your child's winter gear! They might even be ready for a little trip to Antarctica when they have this cozy hat on!